Arado L.II, сконструированный Вальтером Ретхелем и официально зарегистрированный в феврале 1930 года, представлял собой двухместный моноплан смешанной конструкции с деревянным крылом и каркасом фюзеляжа, сваренным из стальных труб и обтянутым тканью. На нем ДальшеMore>>> стоял четырехцилиндровый двигатель Argus As 8. Модификация L IIa имела складное крыло и усовершенствованное шасси. Четыре таких самолета принимали участие в гонках "Europe Rundflug" 1930 года. L IIa имел массу конструкции 415 кг, максимальную взлетную 700 кг, размах крыла 11,0 м и площадь крыла в 17.00 м-. 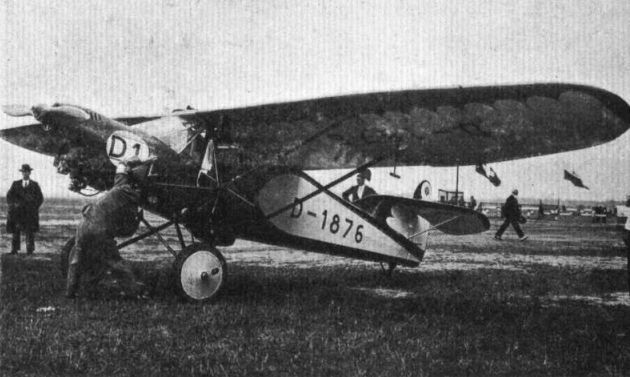 First German Light Aeroplane to be Designed for Inverted Argus. ALTHOUGH the inverted aero engine is no novelty, a German firm having produced engines of this type long before the war 1914-18, the type has never hitherto become really popular. It is probably no secret that the makers of British light aeroplane engines have been experimenting with the inverted type of engine, and could, did the demand exist, put such engines into production at very short notice. We believe we are right in stating that the chief argument used against the inverted "in-line" engine is that with its cylinders hanging down from the nose of the fuselage, there is considerable likelihood of damage if the aircraft turns over on the ground, or even if it merely "stands on its nose." Probably this criticism is quite justified. There are many cases on record in which the machine turned up on its nose, or the undercarriage collapsed and let the machine down on to the ground, the only damage being, perhaps, a broken or bent propeller. The engine was undamaged because the machine "slithered" along on the crankcase, which was strong enough to stand this treatment. A cylinder head, particularly that of the front cylinder, would doubtless have been rather badly damaged. On the other hand, the radial type of engine has two or more of its cylinders projecting below the level of the fuselage, and the number of "casualties" to lower cylinders does not appear to be excessive. While thus the inverted in-line engine may be at a slight disadvantage as compared with the upright engine of the same type, it is no worse off than the radial engine in this particular respect, possibly a little better, and there is no denying the fact that a very fine forward view is attained when the engine is "turned upside down." It is held by some authorities that there is some difficulty in getting as good carburation with the engine inverted, although why this should be so is a little obscure. 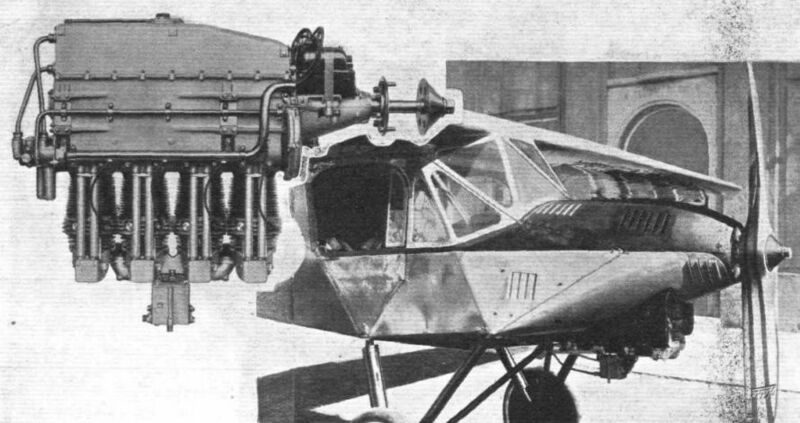 Bearing in mind that a British aero engine firm was the first to produce the four-cylinder, in-line, air-cooled light aeroplane engine which is so popular at the present time, and that at least two firms could without doubt produce inverted versions very quickly, it has remained for the German "Argus" firm of Berlin-Reinickendorff to place on the market the first inverted four-cylinder, in-line air-cooled engine of 80 h.p. One of these engines was, it may be recollected, exhibited at the Olympia Aero Show last July. And the first German aircraft firm to design a machine specially for the inverted "Argus" engine is the Arado Handels-Gesellschaft, of Berlin, whose works are situated at Warnemunde. The Arado L.II, or "Treff As," is a cantilever monoplane two-seater cabin machine, in which the pilot and passenger are placed side-by-side. In aerodynamic design, the machine is fairly orthodox, although the high placing of the horizontal tail surfaces is unusual. 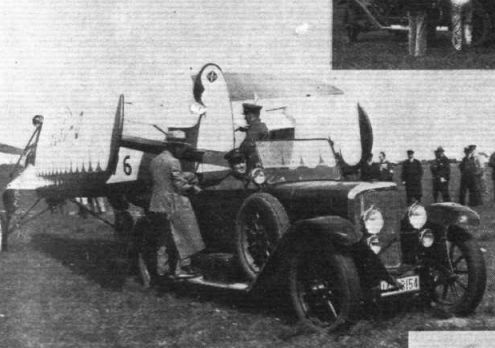 It may be recollected that the original Koolhoven monoplane, now produced in this country by Mr. Desoutter, had its tail surfaces placed high. Although this placing made the machine delightfully indifferent to engine-on and engine-off conditions, it was, we believe, found that in starting it took some considerable time to get the tail up, thereby increasing the length of run required to "unstick." In the production type Mr. Desoutter has dropped the tail plane on to the top longerons. It would be interesting to know whether the same has been found in the Arado "Treff As." The ground angle is large, and one would expect the high tail position to reduce the effect of the slip stream. Constructionally the Arado "Treff As" is of "mixed" type, with a wooden, ply-covered, one-piece wing, and welded steel tube fuselage. The wing structure consists of two main box spars and the usual lattice girder ribs, the plywood covering or planking extending to the rear spar only. The trailing edge portion is covered with fabric, with the exception of the ailerons, which are ply-wood planked. The tail surfaces are all of welded steel tube construction, fabric covered. The photographs of the machine, and the notes sent to us by the Arado firm, indicate a "split" undercarriage, although the general arrangement drawings show the axle type. It is assumed that the machine was originally designed with the older type of undercarriage, but that before completion of the machine this was altered to the divided type. Springing is by rubber rings. The Argus As 8 type engine is, as already stated, of the inverted type, and is neatly cowled in, covered with an aluminium cowling. A fireproof bulkhead separates the engine from the cabin, and the two petrol tanks, each of 55 litres (12-1 gallons) capacity, are mounted one on each side of the fuselage, inside the wings, between the main spars. This position, coupled with the inverted form of engine gives a large head of petrol, ample for direct gravity feed. The seats inside the cabin are placed side by side, and in view of this fact the control stick is placed in the centre, where it can be reached by either occupant. There is a separate foot bar for each, so that school work can be carried out. It is claimed that this arrangement has many advantages for instructional flying in that it enables the pupil to see more clearly what the instructor is doing, and vice versa. Conversations, it is stated, can be quite easily carried out without telephones, and of course, no special flying clothes are necessary, owing to the enclosed cockpit. A cellon windscreen composed of several panels protects the occupants against the slipstream. The sides are left open above the doors, so that in case of the forward screen becoming fogged, the pilot can lean out for landing. At the front corners of the openings in the sides there are small adjustable screens, which can be set to give a minimum of draught inside the cabin. Behind the seats there is a luggage compartment in the form of a canvas satchel, while net racks in the cabin itself may be used for attache cases, maps, etc. The main characteristics of the Arado "Treff As" are :- Length overall, 6-81 m. (22 ft. 4 in.). Wing span, 10-5 m. (34 ft. 5 in.). Wing area, including ailerons, 15-62 sq. m. (168 sq. ft.). Height, 2-28 m. (7 ft. 6 in.). The tare weight of the machine is 405 kgs. (890 lbs.). The load is made up as follows :- Pilot, 75 kgs. (165 lbs. ); passenger, 75 kgs. (165 lbs. ); fuel, 70 kgs. (155 lbs. ); oil. 10 kgs. (22 lbs. ); luggage, 35 kgs. (77 lbs.). Total load, 265 kgs. (584 lbs). Total loaded weight, 670 kgs. (1,474 lbs.). 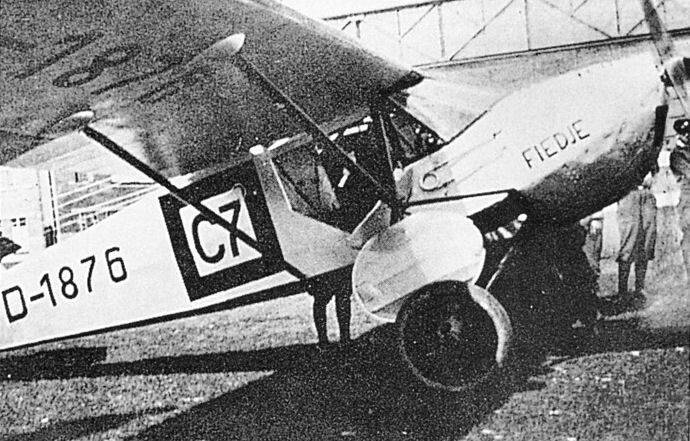 Wing loading, 41-87 kgs./sq. m. (8-78 lbs./sq. ft.). Power loading, 8-37 kgs./h.p. (18-4 lbs./h.p.). The top speed at 3,300 ft. is given as 162 kms./h. (100 m.p.h), and the climb to 3,300 ft. in 8 mins. The Argus As 8 engine develops its rated power of 80 b.h.p at the low speed of 1,400 r.p.m., so that the propeller efficiency should be very good. The inverted "Argus" As8 engine is here shown exposed and, on the right, as mounted and cowled-in on the Arado "Treff As." THE ARADO MONOPLANE: A German Machine, the first to be fitted with the new inverted Argus engine. Note the large streamline casings around the shock absorbers. VARIOUS STYLES OF WING FOLDING: These photographs from the International Touring Competition indicate how aircraft designers of various nationalities provide for reducing space required for garaging machines. 5, is one of the Arado monoplanes, which uses a system intermediate between folding and stacking. Переделанное шасси и складные консоли крыла отличали L IIa (на фото) от L II.